The Mogollon Rim is a broad and iconic feature on the landscape of the American Southwest, a continuous escarpment extending several hundred miles in length from the vicinity of Seligman, Arizona to the New Mexico border. The Rim defines the southwestern edge of the Colorado Plateau and, as such, serves as a geographic and biological dividing line between this high, uplifted region to the north and subtropical desert basins and ranges to the south. Often referred to affectionately as “Rim Country,” the vast swath of land along and adjacent to the Mogollon Rim (pronounced Muggy-Own) is well-known for its outstanding scenery, extensive forest cover, and ample opportunities for outdoor recreation. Several national forests – the Prescott, Coconino, Tonto, and Apache-Sitgreaves – play host to the Mogollon Rim, together offering a seamless expanse of public land where one may revel in such diverse highlights as Sedona’s famed Redrock Country, the historic Highline National Recreation Trail, the high cool respite of the White Mountains, and the largest expanse of ponderosa pine forest in the world. It’s upon this alluring and complementary backdrop of forests, canyons, mesas, and summits that the idea for a Mogollon Rim Trail (MRT) was born. The region has much to offer the long-distance backpacker, yet with limited exception no trails of any significant length wander this ample west-to-east expanse of varied territory. In addition, The Rim, while very much present as a continuous geological entity, over the course of its length reveals itself more prominently in certain places, less so elsewhere, such that at times it feels almost conceptual in nature – or perhaps a part of something broader entirely. Indeed, only by taking a step back is the big picture ultimately revealed, and herein lies the foundation for a 500 mile hike across Rim Country. For truly it is Rim Country – its soul and sense of place, writ large – that stirs the imagination. There are trails, both above and below The Rim, that may be strung together, linked in such a way as to offer a continuous, linear journey, a long-distance hike highlighting the great diversity and many standout attractions of Rim Country. Where trails cease to continue, dirt roads take over. And where there is neither trail nor road, an opportunity to move freely across the land, like the region’s omnipresent wildlife – as the elk, like the mule deer – arises. Recreation trails, quiet forest roads, and cross-country travel – these three represent the standard currency of the invented hiking route, and the Mogollon Rim Trail avails itself of each in order to make continuous passage from here to there. There are trail towns: Familiar names like Sedona, Show Low, and Greer, and those less known – Forest Lakes, Pinedale, Blue – offering provisions for the long journey on foot, spread out at useful intervals along the way, and which the Mogollon Rim Trail reaches directly or runs near. There are documented water sources, campsites, spots to linger, places to explore. The Mogollon Rim Trail seeks out a natural corridor intended to both accommodate the hiking necessities as well as to offer adventure and challenge. Such are the ways of the hiking route. A logical starting point for the MRT, the western edge of Redrock Country is also a natural boundary for recreation. Much farther west and one begins to argue semantics, over exactly where the Mogollon Rim is or is not, and why it might matter. No such question comes to mind at incredible Sedona. Indeed, there is a certain essential quality to beginning a long-distance hike among the sculpted, 1500 foot-high sandstone walls and deep, layered canyons here. This theme, of highlighting the best that Rim Country has to offer, while simultaneously making efficient travel along it, informs the journey the entire way to its eastern terminus, from the Sedona redrocks, to the White Mountains, and finally on to the Blue Range, where it ends at the New Mexico border and joins the route of the Grand Enchantment Trail. These connections, premised upon offering the best possible adventure this landscape can provide, define the very essence of the Mogollon Rim Trail. All the route demands in return is an open mind, a lightweight pack, and the right set of skills. My partner and I explored a route for the MRT over the course of several years, involving several long backpacking trips and countless hours poised longingly in front of a computer screen. What we now present as the Mogollon Rim Trail is in large part well-researched and vetted in the field. As of 2019, several other hikers have also explored the route at length, including three who have completed thru-hikes. (Dirtmonger’s MRT blog entry.) The route remains young in the grand scheme, in the evolution of routes, as these things go. It is prone to change, likely again and again, as we and others complete additional hikes. Let there be no doubt, the MRT is and will remain a hike for very experienced walkers, for those with many miles under their belts and who’ve had their mettle tested away from the beaten paths, regardless of length. Such are the ways of the hiking route. How long is the MRT? About 480 miles from end to end, from outside the town of Cottonwood, Arizona to Alma, New Mexico. When is the recommended season of travel? Spring and Fall, typically April-May and September-October timeframe. What is the suggested direction of travel? Eastbound, both in Spring and Autumn, as the route dries out sooner on the west end during both seasons. You could probably hike it westbound in Autumn, too, although the trail information is written in the eastbound direction. What is the distance between resupply points? Typically 60 to 80 miles. The longest is 90-100 miles. We offer a town guide with information on post office maildrop locations and other town services. What trail resources exist or are planned for the MRT? We have a mapset in beta that we are releasing to a limited number of hikers this Spring. The mapset comes in several versions: one for viewing on devices, one that can be printed to make your own paper maps, and a third that works with the Avenza app for GPS-based navigation. The mapset also includes an extensive databook with information on POI’s along the route as well as offering navigational assistance. We also provide a town guide with information on post office maildrop locations and other town services. In the future we may provide a water chart, which would essentially be a subset of the databook entries. How do I get ahold of maps for the MRT? We have a mapset in beta that we are releasing to a limited number of hikers this Spring. As such, we may not be able to respond to requests for the resource at this time. This should change in the future, but at this stage we’d like to keep foot traffic down on this nascent route, to avoid unnecessary growing pains. We also greatly appreciate feedback from those hikers who do go, particularly water notes and GPS waypoints / tracks. Above all, we need contributions, primarily information, in order to help the MRT grow and evolve in a positive and productive way. 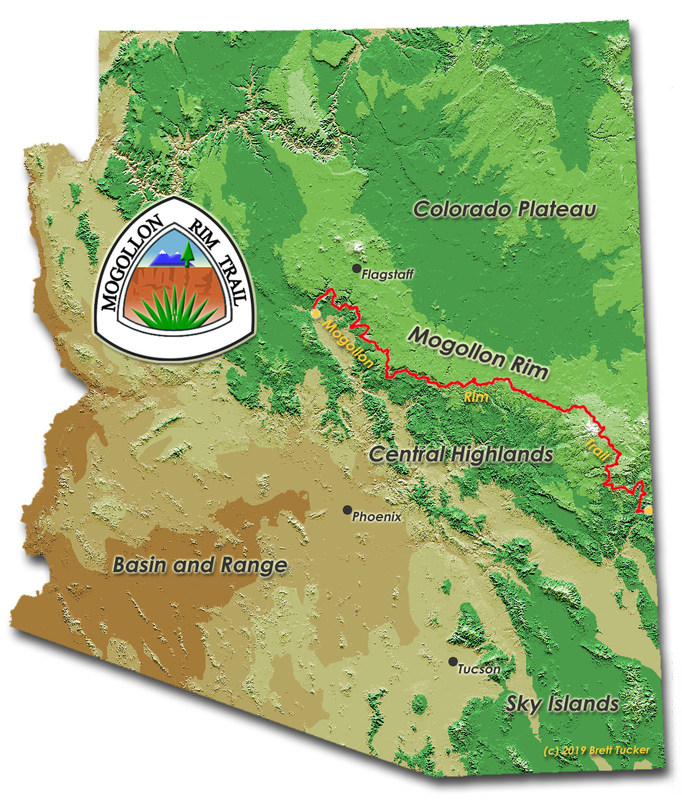 The Mogollon Rim Trail consists of 7 sections, divided between resupply points. This first section of the MRT officially begins at the trailhead for the Parsons Trail outside of Cottonwood AZ. This is a popular access point into the lush desert oasis of lower Sycamore Canyon with its perennial creek, but our route quickly trades well-used trail for something a bit wilder. Where it rejoins Sycamore Canyon Wilderness a few miles on, one beholds a remote and seldom-accessed region below the Mogollon Rim, replete with multi-hued sandstone cliffs rising above a deep canyon floor. The area is considerably rugged, with occasionally brushy desert trails and a very slow-going 3 mile stretch located directly in a dry, rocky portion of Sycamore Canyon’s drainage. The route then climbs steeply to forested Rim Country, where it briefly follows a network of forest roads, then enters the Redrock-Secret Mountain Wilderness via foot trail, descending Loy Canyon to the farther reaches of Arizona’s famed redrock region surrounding Sedona. Old roads and short sections of xc travel next serve as an efficient front-country link, without much exposure to vehicle traffic. Arriving at popular Aerie Trailhead, the MRT again joins singletrack trails, occasionally in the company of cyclists and dayhikers (although the route here has been chosen to minimize exposure to especially popular trails). It then briefly re-enters the wilderness atop Brins Mesa, with spectacular panoramic views of Sedona’s grand array of cliffs, domes, and canyons. Section 1 of the MRT ends near the Jordan Trailhead a couple of miles north of this tourist-friendly town, with a spur route – mostly on trails – then leading directly to uptown (east) as well as West Sedona. Long-distance hikers may prefer to begin in Old Town Cottonwood instead of Parsons Trailhead, which requires several miles of driving rough dirt roads to reach (passenger cars can usually *just* make it when it’s dry). The 13.8 mile Cottonwood Connector alternate route is scenic and diverse, running through Dead Horse Ranch State Park ($3 entrance fee required and $20 tent sites available) and within sight of Tuzigoot National Monument along the Verde River. About half of this alternate route is on trail and the rest on dirt roads. Tuzigoot features a well-preserved Anasazi hilltop village and has interpretive trails. It can be visited on foot via an out-and-back spur route off the Cottonwood Connector (3 miles round-trip). Plan to carry enough water to make it between this section’s occasionally distant sources. While wetter times may offer more favorable opportunities to collect water (from rock pockets in particular), Sycamore Canyon doesn’t regularly flow in its remote upper reaches, and surface water in the Sedona front country can be limited to just a few earthen tanks, unless detouring off-route back to civilization. Prepare accordingly. Camping is not permitted within the “Sedona frontcountry,” which for our purposes can be defined as anywhere outside of the Redrock-Secret Mountain Wilderness between milepoint 29.9 and the end of MRT Section 1 near town. In addition, a Redrock Pass is required for vehicle parking at many trailheads within this area. Camping *is* allowed approximately between milepoints 47 and 49 as the route re-enters the wilderness here briefly. Again, plan ahead to make this first section of the MRT as enjoyable as it ought to be! This section of the MRT tours an eclectic mix of terrain and environments as the route travels across portions of the Mogollon Rim isolated by deep canyons. The hiker repeatedly descends into these riparian canyons – often with perennial water, cooling shade, and multi-hued sandstone cliffs – then climbs back up to arid, rocky mesas clad in juniper, pinyon pine, and occasional ponderosa forest. Each canyon offers its own unique character, such that each day of hiking brings the anticipation of new rewards. Views from atop the Rim are hard to beat, too, though it can’t be overstated: the walking is *rocky* up yonder and water can be hard to come by at times. Be prepared to drink from less desirable stock sources, and always carry a goodly amount out from better creeks and springs whenever possible. Section 2 begins outside Sedona near the Jordan Trailhead. As in Section 1, the MRT initially makes use of the expansive network of singletrack trails available locally. An unbridged crossing of Oak Creek soon presents our first challenge, although the creek is usually safe to ford with care unless it’s rained heavily or the canyon is flush with snowmelt. A natural obstacle for the tourist crowd, nonetheless, Oak Creek offers a gateway to more remote country beyond, and from here we ascend in solitude to the Rim, with spectacular outlooks to Sedona redrock country below. Traveling through Munds Mountain Wilderness, the route gradually descends into colorful Woods Canyon, sometimes flowing or with pools in springtime, otherwise be sure to fill your bottles at the nearby USFS Redrock Visitors Center before proceeding. Indeed, the MRT leaves this famed Redrock Country soon beyond, back up to dry benches pocked with occasional cow tanks. Cairned trails and rock-strewn 4WD roads offer passage to Wet Beaver Creek and our next desert surprise. For this deep canyon is something of a mini-Sedona, a momentary Redrock Reprise, replete with crowds now and then, to be sure, but also some pretty great swimming holes – chilly on a hot day, and offering shade. Vague trails, very rocky roads, and a paucity of palatable water continue the Above-the-Rim theme in this region. A day or so later and the MRT lands on perhaps the most striking feature in this section: West Clear Creek. Again we dive beneath the volcanic upland, but this time the canyon is sculpted from banded white Coconino sandstone rather than the familiar Sedona redrock. West Clear is also a higher-elevation canyon where we find it, replete with ponderosa pine and Douglas fir at creek-level. The riverine environment is strikingly beautiful, with sheer cliffs rising above deep placid pools and verdant meadows. The trail here, though sometimes popular on weekends, remains remote and primitive – just a means to avoid wading. Still, you may briefly find yourself in deeper water at times, lazy and likely not over your waist, but carrying a waterproof pack liner wouldn’t be a bad idea just in case. Climbing out from West Clear Creek on a memorably steep grade, the Rimtop route remains on sandstone underfoot and is well-forested all the way to Pine Canyon. This is our final descent off the Mogollon Rim in Section 2, and heralds our arrival in what could be thought of as classical Rim Country. Here, and beyond in Section 3, the MRT hugs the prominent and continuous west-to-east oriented escarpment of the Mogollon Rim. Forested above and transitional below, the Rim here acquires its reputation as a definitive feature on the central Arizona landscape, one also blessed with a well-developed trail network, of which our route avails itself the final miles toward the community of Pine and the end of Section 2. As in Section 1, camping is not permitted within the “Redrock Zone,” which thankfully is limited to just the first seven miles of Sec 2 (and again at Wet Beaver Creek due to high visitation there). Our route passes through no fewer than three Wilderness areas – Munds Mountain, Wet Beaver, and West Clear Creek. Please be advised that the latter two protect long, sinuous canyons where travel outside the pedestrian-friendly corridor described here is often impossible without technical gear and wetsuits. Plan to stick with the MRT unless you are well-prepared for a completely different sort of adventure (and a very slow-going adventure at that). Just east of the community of Pine lies the western terminus of the 56-mile Highline Trail. The Highline was originally constructed in the late 1800’s as a means of connecting pioneer homesteads and communities along the Mogollon Rim. The trail fell into disuse as the construction of nearby roads diminished its value as a travel corridor. Luckily the future value of the Highline Trail lay in recreation: it was designated a National Recreation Trail in 1979, and serves to this day as one of Arizona’s classic multi-day backpacking trips. It isn’t hard to see why. With the prominent escarpment of the Mogollon Rim above, and sweeping views of forests and mountains of the Central Highlands to the south, the Highline Trail offers a scenic middle ground from which to experience the best that this part of the state has to offer. The Mogollon Rim Trail in this section uses the Highline National Recreation Trail in its entirety. The first third of this NRT has also been adopted as the route of the Arizona Trail, which is by far the most popular stretch of the Highline and also the best constructed, although recent and ongoing trail projects are successfully restoring time (and fire and flood) worn portions of the Highline elsewhere as well. After leaving the Highline Trail, the MRT uses other forest service trails that place us Above-the-Rim once again, first touring alongside its dramatic edge (wow! ), then sending us leisurely inland through ponderosa pine forest and adjacent Willow Springs Lake, one of several picturesque man-made lakes in this region. At last the MRT pops out of the woods at Forest Lakes Estates, a small community of summer homes that offers a post office, a couple of small grocery stores, restaurants, and possible lodging. Forest Lakes has just enough on hand to lend some comfort after several days in the backcountry, or if more amenities are desired, the larger community of Heber-Overgaard lies 15 miles east along Highway 260 via hitchhike. There’s also a walk-in option to Heber available in the early miles of MRT Section 4. Following a winter season of average or above-average precipitation, water availability in this section tends to be relatively abundant. The Highline Trail in particular is renowned for its frequent wet drainage crossings and trailside springs. In autumn, or in springtime of drier years, water may be encountered with less frequency. The route of the MRT is only occasionally shaded in its early miles, in part due to the elevations (generally below 6500 feet) and also from fires that have affected portions of the Highline Trail over the years. Despite its appearance on maps, the Highline does not provide an easy contouring hike, but is more of a roller coaster experience, with many small ascents and descents as it wends its way along the rugged base of the Mogollon Rim which is so prominently on display here. Nonetheless, this is Rim Country hiking at its finest, with rewards that equal the efforts and then some! The Mogollon Rim in this section of the route once again changes character. The Rim with its well-defined prominence, so evident along the Highline Trail in Section 3, here expresses itself in subtler fashion. At the same time, public lands recreation opportunities in this region become entirely Above-the-Rim in nature, as Fort Apache Indian Reservation lands now lay to the south. Indeed, this portion of Rim Country, and the MRT along with it, is defined by the bounds of the Sitgreaves National Forest, which protects a high, rolling belt of ponderosa pine and juniper forest at the southern edge of the Colorado Plateau. The hike is less about experiencing The Rim, per se, and much more focused on this wide (but fairly narrow) swath of forested land and the mellow brand of travel it offers up. No discussion of this region would be complete without reckoning with the effects of the Rodeo-Chedeski Fire. In 2002, this human-caused blaze (actually two separate fires that later merged) burned across nearly half a million acres, becoming – at the time – the largest fire in Arizona history. The wind and terrain-driven Rodeo-Chedeski Fire burned in a complex mosaic pattern – very hot and quite devastating in some areas, cooler and more beneficial in others – such that a cross-section of the burn zone as experienced along the MRT presents a remarkable lesson in contrasts. Hikers will spend significant time in areas that, half a generation ago, were largely reduced to embers, but which are often now well on their way toward recovery – still quite open and exposed to the elements but with young trees and shrubs well-established among the old fallen timber. Then, just around the next bend, the trail may re-enter a tall stand of ponderosa pines nearly absent any evidence of the fire at all, replete with shade and bird song, and in many cases offering excellent camping opportunities. In the first half of this section, the hiker gets much better acquainted with the General Crook National Recreation Trail, which the MRT followed briefly at the end of Section 3. The 200-mile-long General Crook began as a pioneer-era supply route that was gradually outmoded with the completion of the first trans-continental railroad and nearby Rim Road. For many years it fell into disuse until the US Forest Service, in concert with the Boy Scouts of America, revived the historic route as a recreation trail, marking it with metal chevrons nailed to trees. Parts of the General Crook Trail today are located on actual singletrack trail, while much of its route here in MRT Section 4 happens to be on old roads (the MRT joins the Crook Trail in earnest at around Mile 23). The distinctive V-shaped markers can still be found along the way, now aided with other signs and blazes as well, but the General Crook is inherently a “nod to the past” and so for best results, plan to navigate it with map and guidebook in hand, so to speak. The second half of this section of the MRT enters a large, modern trail network developed and maintained by an organization called TRACKS, based in Show Low. These trails form part of the greater White Mountain Trail System, which extends both west and east of Show Low (and which the MRT continues to use in Section 5 ahead). Trails are often singletrack (sometimes on roads for a portion), and are fairly well-marked and expeditious for travel. One presumably should expect to encounter more bicycles than hikers, although in our experience few of either group are commonly encountered outside of the summer season when the local population swells with visitors looking to escape the desert heat. Water can be a concern in this region. The terrain is undulating, with few deep, well-defined canyons and no perennial creeks along our route between Forest Lakes and Show Low. Windmills and related infrastructure are uncommon here. What this section does have in relative abundance are stock tanks, the majority of which are silty. We found some to have a fair amount of staying power into the drier autumn season, but these sources are always of last resort any time of year, and as such, hikers would do well to carry enough water to make it between the several trick tanks (aka guzzlers, usu with water dispensed into a metal trough), springs, and seasonally flowing drainages found in this section. Two communities – Heber and Pinedale – are located a modest distance off the route of the MRT in the course of this 77 mile section. Heber (also known as Heber-Overgaard) lies 6 miles away, as accessed from Mile 12 of the main route, and has an array of services, offering a good alternative (or complement) to tiny Forest Lakes. Pinedale is about 2 miles away (at Mile 52) and offers only a post office although you should also be able to obtain water in the community if your bottles are running dry. Finally, don’t be put off by the MRT’s proximity to Highway 260 in parts of this section. It appears to loom large on the maps, but in reality the busy 2-lane road is usually far enough away and of limited consequence. We found the trails and side dirt roads in this part of Rim Country to be surprisingly quiet and little-used, including fall hunting season when we were first out exploring the route. A gradual ascent into the heart of the White Mountain region defines this relatively short section of the MRT between the communities of Show Low and Greer. The route begins in the sprawling vacation-land of Show Low / Pinetop-Lakeside, soon re-enters National Forest, and rejoins the now-familiar trail network built and maintained by the local TRACKS trail club. The Mogollon Rim Trail, also in familiar form here, threads the well-constructed web of loop trails, sampling each as needed, in order to make continuous, linear passage across the region. Yet changes are also afoot here in Section 5. As the miles pass by, so too the landscape begins to change: a mixed conifer forest along with aspens gradually replaces the junipers and ponderosa pines that predominate to the west. And as elevations trend upward, the land itself rises in its entirety to form a broad plateau, considerably higher than the Mogollon Rim we’ve known thus far. At over 9000 feet above sea level, sprawling grassland meadows abound in this landscape, punctuated by deep, dark forests on the slopes of protruding hills, volcanic in origin. It’s a unique and distinctive environment, particularly for the Southwest United States. Welcome to the White Mountains of Arizona! If you haven’t resupplied in Show Low at the start of this section, then another good option is Pinetop-Lakeside, reached near mile 4 of the route and one to two miles away via paved roads, hitchhiking or taxi. The Lakeside post office in particular is a good place to send a maildrop, since it’s closer to the MRT than the post office in Show Low. Fill water bottles while you’re at it, as the first half of this section can be rather dry, with earthen tanks serving as water sources more often than not. Luckily, progress is quick and easy for the most part thanks to ample well-graded singletrack and clearly signed junctions along the way. Constructed trail eventually ends, an inevitability as the influence of Show Low fades with our easterly progress away from town. Quiet dirt roads take over instead, often well-shaded – or with autumn foliage on display – leading us toward the highest terrain, where ubiquitous small rounded peaks of the White Mountain Volcanic Field rise out of broad meadows, seasonally flush with spring snowmelt, small springs, ponds, and creeklets. It’s here in the final miles before our route reaches Greer that an old logging railroad once hauled timber to busy sawmills at the town of McNary on the nearby White Mountain Apache Reservation. These century-old economic aspirations eventually took a foray into the realm of tourism, as the railroad became a sightseeing enterprise, before finally ceasing operations altogether in the 1970’s. In the 90’s, the US Forest Service took it on as a rails to trails initiative, and today the Apache Railroad Grade Trail traverses the heart of this scenic region for some 20 miles, a well-graded and wide-open non-motorized gravel path. The MRT uses a memorable 7 miles of the Railroad Grade Trail here in Section 5, offering – among other highlights – unobstructed views to 11,400-ft Mount Baldy which we’ll approach more closely in Section 6. Expect occasionally wet feet in springtime on a typical thru-hiker itinerary, as these high meadows can hold onto snowpack later than you might otherwise expect. The small hamlet of Greer provides welcome, if basic, provisions at the end of this stretch. More than a few Arizona desert dwellers will have fond memories of family vacations to Greer and the surrounding White Mountain region, and indeed summer homes dot the immediate area, a cool respite from the sweltering summer heat elsewhere in the state. All the same, Greer retains a small, rustic, charming quality that makes it an ideal trail town after the bustle of Show Low, and an important stopover before tackling the remote and challenging country ahead en route to the New Mexico border. Vast meadows, blue lakes, and cool forests of pine, spruce and fir herald our continued tour of Arizona’s White Mountain region here in MRT Section 6. Rising out of this high plateau, Mount Baldy – at over 11,400 feet the state’s highest summit outside of the San Francisco Peaks near Flagstaff – commands early attention as the route tours its namesake Wilderness area. Trout fishing waters abound here, and in fact no other mountain in Arizona produces as many rivers and streams. The Black River, its headwaters draining Mt Baldy’s southerly flanks, carves a deep, sinuous canyon into the volcanic upland, presenting a wild and challenging option for travel as our route continues onward. So too, the Bear Wallow Wilderness, which the MRT explores for a number of miles, its permanent waters and abundant wildlife as noteworthy as its relative absence of people. Given a healthy distance from large population centers and difficult access, the southern extent of the White Mountains seems the very definition of the word remote, and this remarkable sense of isolation follows us off the Mogollon Rim and into the adjoining Blue Range Primitive Area as well. Section 6 ends at the tiny outpost of Blue, Arizona, population 35. With only a post office to its name, Blue presents a spare and fitting conclusion to the arduous, rewarding, and diverse miles traveled since Greer. More than any other section of the route, this one demands careful consideration of resupply opportunities. The MRT runs directly by the Blue post office (where you’ll eat solely out of your maildrop box) for a good reason – it’s the first and only straightforward means of resupplying provisions in over 90 miles. Other possibilities do exist: Alpine, for one, a small town with PO, grocery store, and a couple of restaurants. Hannagan Meadow for another, a tiny wayside offering lodging, meals, and the option to hold a hiker package. But both Alpine and Hannagan Meadow are quite difficult to reach; neither resupply is of the walk-in variety off the route of the MRT itself, and hitchhiking tends to be extremely challenging. Even along paved roads leading the 10 or 20 miles to these locations, traffic is often limited to a vehicle or less per hour. Yes, you might get lucky on a weekend, or by a fishing lake, or with a truck full of hunters, but you definitely shouldn’t count on it. As such, the safest approach is to pack enough food to go from Greer to Blue, and then to use any good fortune along the way to treat yourself to a meal or room in either of the two aforementioned communities. Your itinerary will be determined in part by whether you opt to explore more of the Mount Baldy Wilderness in the early miles of this section. An alternate route climbs to the boreal heights of this wild area’s namesake crest, offering commanding views in all directions, but the rewards must be earned, as snow and fallen trees often prevent easy progress in springtime. Taking this memorable alternate route adds 9 to 12 miles to the distance between Greer and Blue (so about 100 miles all told, and slow miles at that). Likewise, the main route of the MRT follows a primitive trail along the Black River for a dozen miles, requiring numerous unbridged crossings. The canyon is remarkably wild but the river is indeed darkly hued as its name implies and the streambed strewn with slippery rocks. Forward progress is inevitably slower, so plan your daily mileage accordingly. Also consider packing along something lightweight and buoyant so you can kick and wade rather than testing your balance with each crossing (inflatable pool toys are a favorite of Arizona’s canyoneering community). During peak snowmelt season the Black River often runs high and cold, such that you may need to detour. An alternate route is available for just this reason, of comparable distance to the main route though mainly on graded forest roads throughout. In May and June of 2011, the Wallow Fire burned over half a million acres, eclipsing the Rodeo-Chedeski Fire to become the largest in Arizona’s history. The fire’s point of origin was in the Bearwallow Wilderness but its scars are visible across a broad swath of the White Mountains. Yet with the region blessed both in size and recreation opportunities, there remain today enough trails and points of interest to string together a hiking route that avoids a majority of the Wallow Fire’s impacts. But make no mistake, this is a challenging section of the MRT even without the effects of wildfire. Trails are often little-used and even less frequently maintained. The terrain, more often than not, is rugged, with considerable elevation gain and loss. Eastbound thru-hikers will have already tested their mettle especially on the first two sections of the route from Cottonwood to Pine, but Section 6 is arguably tougher. It’s certainly longer, and the sense of isolation raises the stakes if things don’t go quite according to plan. So pack an adventurous attitude, and the requisite skill set. Cell phone reception can be non-existent at times. As the route once again drops off the Mogollon Rim in the later miles of this section, vistas open up to prominent landmarks beyond the scope of this hiking route: Mount Graham is visible near Safford to the southwest, the high peaks of the Gila Wilderness to the southeast. Crossing the lonely, winding “Coronado Highway,” The Rim appears to rise ever higher as we in fact fall away from it, still farther into the low country beyond. Geographically, the Mogollon Rim is almost to its easterly extent here, but we still have some adventurous miles left to walk. Section 7 will take us there, across the desert-riparian wilds of the Blue Range and onward to the Grand Enchantment Trail. The Blue Range isn’t so much a singular mountain range as it is a seemingly chaotic jumble of peaks and ridges, incised by myriad canyons both large and small, the entirety of it drained by the Blue River. As such, you won’t find a “Blue Range” labeled by the cartographer’s pen on most maps, but instead references to the Blue Range Primitive Area, which contains a majority of this wild country within its bounds. Primitive Area is an early designation, a vestige of 1930’s-era federal management that pre-dates the more modern Wilderness classification. Most of the original Primitive Areas would ultimately go on to become official Wilderness areas, but due to local opposition the portion of the Blue Range within Arizona never did. It’s a semantic point for the most part; outwardly this is a landscape “where man is a visitor who does not remain,” as the Wilderness Act would otherwise describe it. It’s remote, rough, and largely pristine. Travel is limited to foot and hoof traffic, and use tends to be light. It’s sufficiently wild that the Blue Range was chosen as a primary recovery area for the Mexican gray wolf, where this species increasingly flourishes. And it makes for a fitting conclusion for the Mogollon Rim Trail, which journeys across the heart of this scenic region on its way to the New Mexican border. Section 7 of the MRT begins along the canyon of the Blue River in the tiny community of Blue, at the base of the Mogollon Rim. The river drains south and is a primary travel corridor across the Blue Range, but our route instead samples a broad swath of the region and isn’t beholden to the river or its numerous required fords (30 to as many as 60 fords depending on the exact route). We’ll cross it a mere total of four times in this section, two of which occur along the main road into Blue in the early miles (the same unbridged crossings the postal service has to negotiate for mail to reach the Blue PO!). Once back in the Primitive Area again, the initial one-third of the route to New Mexico makes use of better trails that are at least somewhat popular in the warmer seasons. There are a couple of route options to choose from as we ascend through pleasant forested country adjacent to Bear Mountain, a prominent peak in the northern Blue Range with good outlooks toward the Mogollon Rim. Thereafter, beyond Bear Valley, the MRT changes character as it follows little-used trails and drainages that present challenging terrain and navigation at times, and that ultimately define the adventurous nature of this final section. Little Blue Box is a highlight of this sometimes slickrock desert canyon environment, a narrow, sheer-walled stricture hewn from conglomerate and ash-flow deposits. The rocky drainage serves as the trail here and the going is often wet (wading may be necessary after substantial rains). Nearby Hannah Hot Spring is another standout feature, its pools and riparian surroundings enticing the intrepid traveler to explore ever farther into the remote depths of this land. After a final two crossings of the Blue River, the MRT makes a turn toward the east and begins a long climb toward the New Mexico state line. The dry ridge stands in stark contrast to the often water-blessed canyon hiking to this point. (Indeed drinking water is probably not a major concern overall in this section, particularly in the spring, but you’ll want your belly sloshing beyond the Blue River for best odds.) A memorable 40 miles across the Blue Range in this section concludes by a humble cattle gate in a wire fence on a lonely mesa some 10 miles from the tiny outpost of Alma. Welcome to the eastern terminus of the MRT, and congratulations! For those finishing a thru-hike here, nearly five hundred diverse miles mark your path of exploration across Rim Country, the White Mountains, and the Blue Range. The Mogollon Rim has been your faithful companion, sometimes prominently on display, other times more theoretical in nature, but ever defining the geographic and biological bounds of the Colorado Plateau. Leaving Arizona, you’ll join the route of the Grand Enchantment Trail. If you’ll be concluding your hike at Alma (our first encounter with civilization since Blue), then plan on hitchhiking the 65 miles or so from here to Silver City unless you’ve made prior arrangements. Otherwise, the GET is your ticket to further adventure, east or west. Some hikers may wish to explore the Gila Wilderness, and the Gila Cliff Dwellings in particular makes for a satisfying conclusion to the long journey, with Silver City again within reach. See the MRT town guide as well as the GET website for further options.